Arrive into Auckland and transfer to your hotel. The remainder of the day is at leisure, with plenty of shops, cafés and attractions within easy reach of your accommodation. The Auckland Museum is one of the best places to explore the culture of this country, being home to the best collection of Maori treasures in the world. Alternatively, why not take a trip to the top of the Sky Tower for incredibly views or take a ferry to Waiheke Island. Leave Auckland this morning for Muriwai Beach on the West Coast – just a short walk from here brings you close to the gannet colony which nests on the cliffs. Continue on to the Matakohe Kauri Museum to learn more about the mighty kauri trees. Just north of Dargaville, you’ll enter the primeval forest of Waipoua where you can accompany a group of young Maori guides who are dedicated to preserving the traditions and customs of Ngapuhi – the northern Maori tribe – to visit Tane Mahuta. This is the largest standing kauri tree known to exist and a magnificent sight to behold. 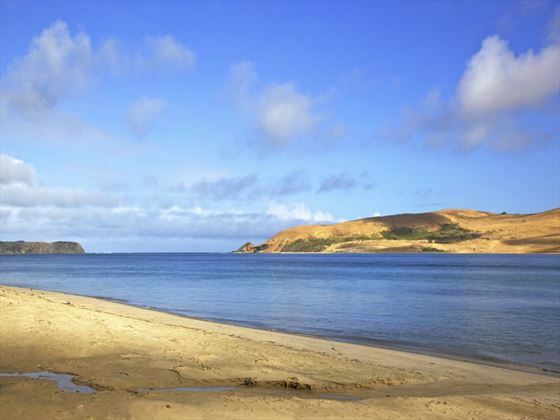 Take a cruise across the Hokianga Harbor to explore the sand dunes – if you’re feeling particularly active, you may want to body board down the dunes as well! Afterwards, catch a ferry from Rawene to Kohukohu and drive to Kerikeri – an area known for citrus orchards and arts. From here, you’ll journey to Waitangi in the Bay of Islands. 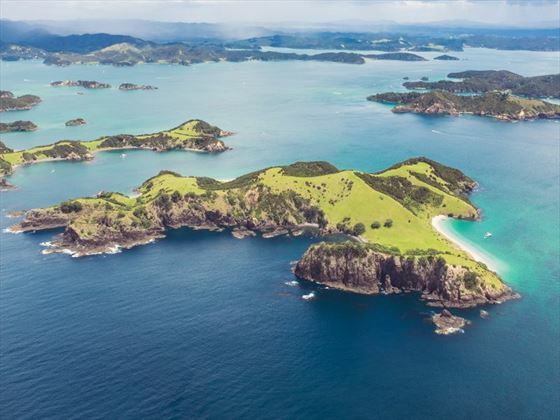 From Paihia, cruise to a maritime park of 144 islands on a purpose-built catamaran designed for viewing dolphins and swimming; alternatively, cruise to the Hole in the Rock. Disembark at Russell – this is a destination with a colourful past, once the haunt of whalers and sealers in the 19th century. Take some time to wander along the waterfront and admire the colonial buildings before re-joining the coach to drive up Flagstaff Hill for amazing views of the township. Later on, drive back to Waitangi. Today sees you visit a significant attraction in New Zealand history – the Waitangi Treaty House, where local Maori signed a treaty with Queen Victoria’s representatives in 1840. While you’re here, be sure to visit Ngatokimatawhaorua which is one of the world’s largest carved out war canoes. 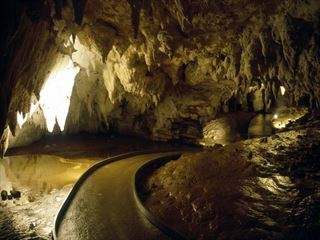 In the Waiomio Valley, you’ll be guided by the Kawiti family through the glow worm caves. Continue on from here to Whangarei and over the Brynderwyn Hills as you make your way to Auckland. Venture over the Bombay Hills and Hauraki Plains today to the Coromandel Peninsula. After touring this picturesque region, you’ll enjoy a special lunch at Rapaura Watergardens, with the chance to walk through the native bush to a waterfall and lily ponds. Further north at Coromandel, there is a rich gold mining history which is visible through the restored wooden buildings which line the streets. As you cross the ranges, you’ll be treated to visits at some of the beautiful beaches along the way, including Otama, Kuaotunu, Matarangi and Whangapoua. You’ll spend the night in Whitianga on Mercury Bay. Begin the day with a short ferry ride to Ferry Landing, near Cooks Beach, where you’ll meet your coach. Alternatively, you could take a glass-bottomed boat ride to Cathedral Cove (optional). Visit Hahei Beach and the nearby Hot Water Beach, where naturally-occurring thermal hot springs bubble up through the sand. Depending on the tide times, there may even be the chance to dig your very own thermal hot pool. Continue on to Whangamata and Rotorua – at Ohinemutu Village, by Lake Rotorua, you’ll meet Shaloh Mitchen and will receive a personal introduction to Maori culture. Enjoy a day at leisure today in this lakeside town, where you may want to take a cruise on Lake Rotoiti to explore the tranquil coves and swim in the lake, or soak in the hot pools which are reached only by water. Once you’ve arrived back ashore, you can relax over lunch at the Pounamu Lodge with your hosts David and Karen who will regale you with stories of their ancestors and how they coped when Mt Tarawera erupted in 1886. Afterwards, visit the museum in Rotorua to explore some of the cultural treasures of the country. 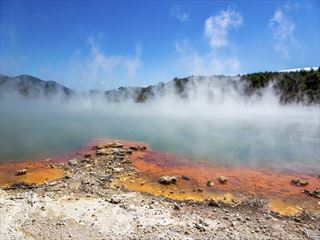 Today offers a special visit to a popular geothermal hideaway – Orakei Korako. Crossing the lake to silica terraces, bubbling mud pools and an Aladdin’s Cave, Ruatapu, you’ll then see the thunderous Huka Falls and three active volcanoes from Taupo – Tongariro, Ngauruhoe and Ruapehu. 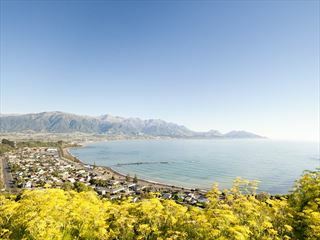 The road takes you over the ranges to Napier which is renowned for being a step back in time to the 1930s, brimming with art deco architecture. Go wine tasting at a nearby vineyard before joining a guided sightseeing coach tour through Napier. Drive to the town of Havelock North and up Te Mata Peak for amazing views of the region, before journeying south through the pastoral landscape of Hawke’s Bay to the Wairarapa. There will be a visit to the Pukaha Mt Bruce Wildlife Center where you can see endangered birds such as the kiwi, kokako and the tuatara – a ‘living fossil’ reptile which lived at the time of the dinosaurs. End the day by making your way across the Rimutaka Ranges to Wellington. Today you will catch the Interislander Ferry across the Cook Strait and up the Queen Charlotte Sound to Picton. From here, you can tour the beautiful Marlborough region, which is renowned as a premier food and wine producer, in particular sauvignon blanc. 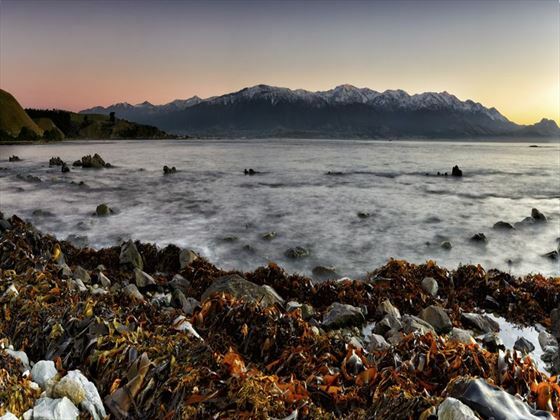 Afterwards, drive to Kaikoura where you’ll be in a prime location right on the waterfront. On day 12, you’ll be able to explore this coastal area in more depth, with a two and a half hour cruise on the ‘Albatross Encounter’ for a close-up viewing of these fascinating seabirds. In addition to 12 different species of albatross, there are also penguins, petrels, gannets and shearwaters, plus many more species which feed in Kaikoura. Back ashore, you’ll have time to relax and walk along to the nearby seal colony or take an optional seal swim or whale watching cruise. Continue along the highway to the Canterbury Plains where you’ll be surrounded by stunning scenery. There is a special lunch arranged for today where you’ll dine at the Akaunui Farm homestead with your hosts, Di and Ian Mackenzie, where you’ll learn about life on the farm and dine on fresh produce from the gardens. Take a tour of the breath-taking MacKenzie region as you explore the surrounding vistas of tussock lands and mountain scenery. There are some great photo opportunities to be had at Lake Tekapo with visits to the Church of the Good Shepherd and the famous statue of high country sheep dog. Awake at the foot of Mt Cook today – New Zealand’s highest mountain and known as Aoraki, ‘the cloud piercer’, in Maori. There will be time to take an early morning walk in the neighboring valleys before heading towards the mountain-rimmed Mackenzie Basin, over the Lindis Pass and through the Kawerau Gorge into Queenstown. In Queenstown, ride the Skyline Gondola to the top of Bob’s Peak for an amazing panoramic vista of the resort below. Journeying alongside Lake Wakatipu to Te Anau and Milford Sound, you’ll be struck by the sheer beauty of this area. The Milford Road is world-famous and a panorama of deep glacier-studded valleys, stark mountain ranges and reflective lakes. Board a vessel with a nature guide upon arrival at Milford, where you’ll take to the inky waters to learn more about the beautiful fiord which is dominated by Mitre Peak. Look out for the playful seal colonies where the sound meets the Tasman Sea. You’ll return back to Queenstown via a scenic flight for spectacular views of the landscape below. Spend the whole day at leisure today, exploring this wonderful resort town for yourself. There’s something for everyone here, from the extreme to the sedate. Why not take a jet boat ride along the Dart River or visit some of the locations used in the Lord of the Rings films? 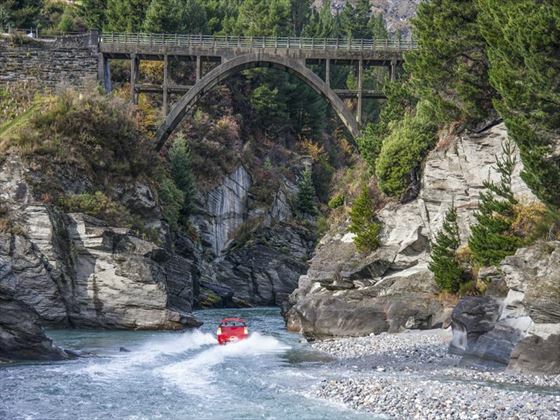 White water rafting down the Shotover or Kawarau River is an unforgettable experience, while there are plenty of boutique shops and walkways to stroll along if you’re looking to unwind. Begin today with a visit to the village of Arrowtown, a destination with a rich gold mining history. You’ll then follow the road over the Crown Range where you’ll be rewarded with beautiful views of the Gibbston Valley. 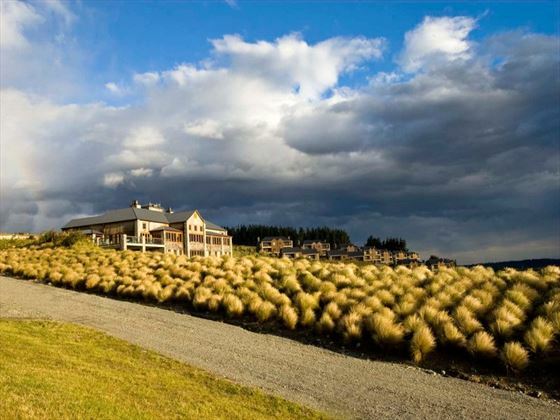 There will be a stop at the historic Cardrona Hotel, with a history dating back to the gold mining era, before enjoying a relaxed and memorable lunch at a Wanaka homestead. Make the most of some free time after lunch to explore Wanaka for yourself. 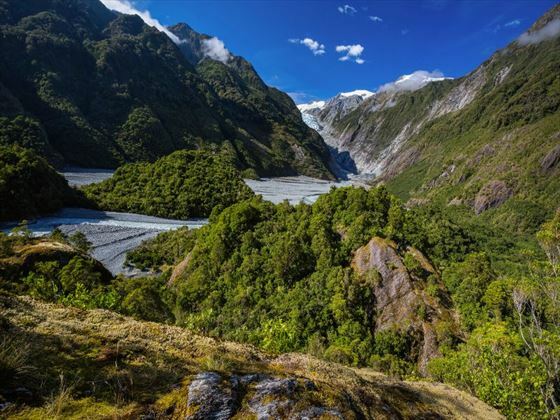 The journey takes you past Lakes Wanaka and Hawea today as you venture into unspoiled mountain scenery of the Haast Pass in Mt Aspiring National Park. You’ll be led via tracks in the native beech forests to clear blue pools and cascading waterfalls, before you leave the mountains and take the riverside to Haast. Head north through the Westland World Heritage Park rainforests, stopping en-route to Ship Creek to wander along the beach. You’ll view Fox Glacier as you make your way further into the rainforest and Lake Matheson which is famous for its reflections of the Alps. 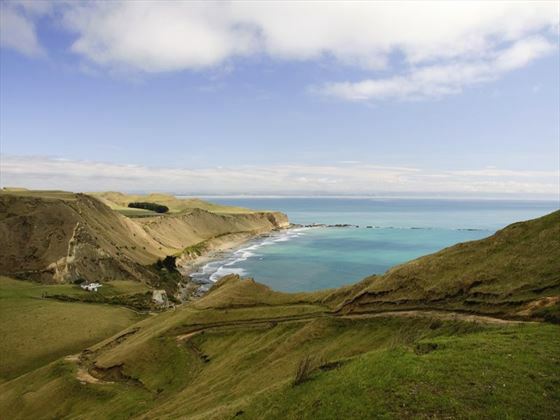 Today offers a special visit to the settlement of Okarito which is located between the Okarito Lagoon and the Tasman Sea. You can either take a gentle kayaking excursion or a boat cruise along the shallow waters of the lagoon, which is the feeding ground for the rare white heron which breeds in the nearby reserve. 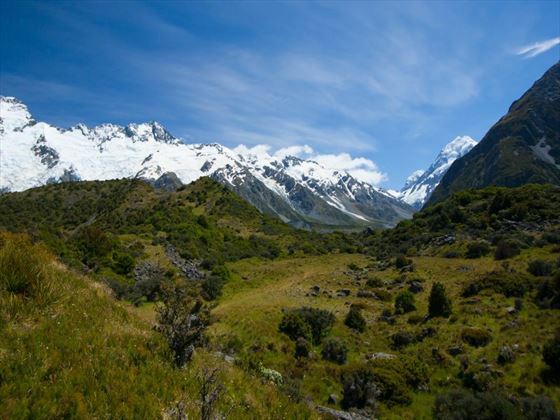 This World Heritage Park is incredibly picturesque and tranquil – perhaps you may wish to take a helihike on the glacier or a flight over the Alps to Mt Cook. Alternatively, take a dip in the hot pools which are fed by pure glacier water. Head north today as you pass the Southern Alps to reach Hokitika which is known for its artisan crafts, such as glass blowing, wood carving and pounamu (greenstone) carving. The coastal road takes you along part of the ancient route used by Maori and offers up unique coastal flora along the way. 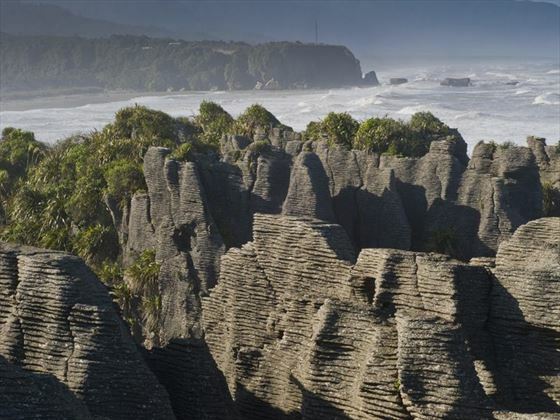 The Punakaiki Pancake Rocks are along this route and are unique attractions that you won’t want to miss. Celebrate the trip with dinner at the hotel this evening. Today sees you retrace your steps down the coast as you journey up the Otira Gorge on an amazing cantilevered road to Arthur’s Pass National Park. Upon reaching the summit, admire the views and watch the keas (alpine parrots) as they fly between the mountains. There is the opportunity to stretch your legs in the beech forests at Arthur’s Pass village. Descend into Porter’s Pass to the Canterbury Plains before reaching Christchurch in the late afternoon. After a leisurely breakfast this morning, transfer to the airport for your departing flight. 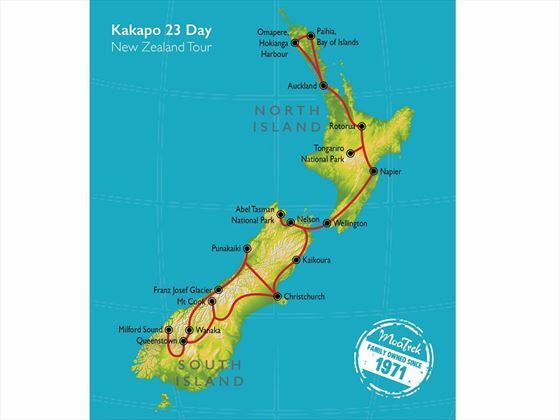 Included activities and entrance fees: Kauri Museum, guided walk with Maori guides to Tane Mahuta, exploring Hokianga Harbour, exploring Kerikeri's Stone Store, Waitangi Treaty House, dolphin cruise and swim at the Hole in the Rock and Cape Brett, Kawiti Caves glowworms tour, cruise along Lake Rotoiti on the luxury yacht ‘Tiua’, Te Wairoa buried village museum, Kiwi encounter in Rotorua, Wai-O-Tapu, guided tour of Napier, scenic cruise across the Cook Strait and Queen Charlotte Sound on the Interislander ferry, wine tasting in Marlborough, cruise to Abel Tasman National Park, Skyline Gondola in Queenstown, 1.45 hour nature and wildlife cruise on the Milford Sound, scenic flight above to Southern Alps from Milford Sound to Queenstown, guided kayak or cruise around Okarito Lagoon.